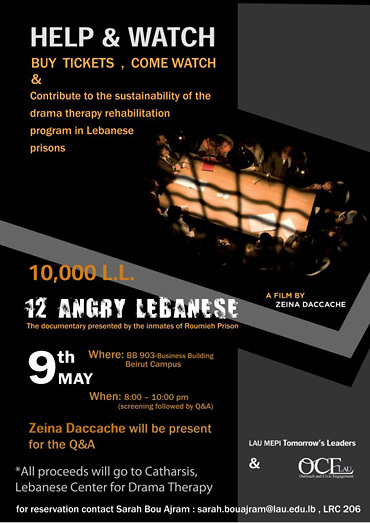 The Outreach and Civic Engagement Unit along with the LAU–MEPI Tomorrow’s Leaders Program are proud to bring to you Zeina Daccache’s widely acclaimed film presented by the inmates of Roumieh Prison entitled 12 Angry Lebanese. The projection of the movie is part of a fundraiser for the betterment of the lives of the inmates of Roumieh Prison. A Q&A with Zeina Daccache will follow the projection. Tickets will be sold for LL10,000 on both Beirut and Byblos campuses starting May 3, 2011. For further information about how to get the tickets, please contact Zaher Kamaleddine at zaher.kamaledine@lau.edu.lb. or Sarah Bou Ajram at sarah.bouajram@lau.edu.lb.